How much CO2 emission is too much? This week, representatives from around the world will gather in Nairobi, Kenya for the latest Conference of Parties (COP) meeting of the Framework Convention of Climate Change (FCCC) which brought us the Kyoto Protocol. The Kyoto Protocol expires in 2012, and the task facing the current delegates is to negotiate a further 5-year extension. This is a gradual, negotiated, no doubt frustrating process. By way of getting our bearings, a reader asks the question, what should the ultimate goal be? How much CO2 emissions cutting would it take to truly avoid “dangerous human interference in the climate system”? On the short term of the next few decades, the line between success and excess can be diagnosed from carbon fluxes on Earth today. Humankind is releasing CO2 at a rate of about 7 Gton C per year from fossil fuel combustion, with a further 2 Gton C per year from deforestation. Because the atmospheric CO2 concentration is higher than normal, the natural world is absorbing CO2 at a rate of about 2 or 2.5 Gton C per year into the land biosphere and into the oceans, for a total of about 5 Gton C per year. The CO2 concentration of the atmosphere is rising because of the 4 Gton C imbalance. If we were to cut emissions by about half, from a total of 9 down to about 4 Gton C per year, the CO2 concentration of the atmosphere would stop rising for awhile. That would be a stunning success, but the emission cuts contemplated by Kyoto were only a small step in this direction. Eventually, the chemistry of the ocean would equilibrate with this new atmospheric pCO2 concentration of about 380 ppm (the current concentration), and its absorption of new CO2 would tail off. Presumably the land biosphere would also inhale its fill and stop absorbing more. How long can we expect to be able to continue our lessened emissions of 4 Gton C per year? The answer can be diagnosed from carbon cycle models. A range of carbon cycle models have been run for longer than the single-century timescale that is the focus of the IPCC and the FCCC negotiation process. The models include an ocean and often a terrestrial biosphere to absorb CO2, and sometimes chemical weathering (dissolution of rocks) on land and deposition of sediments in the ocean. The models tend to predict a maximum atmospheric CO2 inventory of about 50-70% of the total fossil fuel emission slug. Let’s call this quantity the peak airborne fraction, and assume it to be 60%. The next piece of the equation is to define “dangerous climate change”. This is a bit of a guessing game, but 2°C has been proposed as a reasonable danger limit. This would be decidedly warmer than the Earth has been in millions of years, and warm enough to eventually raise sea level by tens of meters. A warming of 2° C could be accomplished by raising CO2 to 450 ppm and waiting a century or so, assuming a climate sensitivity of 3 °C for doubling CO2, a typical value from models and diagnosed from paleo-data. Of the 450 ppm, 170 ppm would be from fossil fuels (given an original natural pCO2 of 280 ppm). 170 ppm equals 340 Gton C, which divided by the peak airborne fraction of 60% yields a total emission slug of about 570 Gton C.
How much is 570 Gton C? We have already released about 300 Gton C, and the business-as-usual scenario projects 1600 Gton C total release by the year 2100. Avoiding dangerous climate change requires very deep cuts in CO2 emissions in the long term, something like 85% of business-as-usual averaged over the coming century. Put it this way and it sounds impossible. Another way to look at it, which doesn’t seem quite as intractable, is to say that the 200 Gton C that can still be “safely” emitted is roughly equivalent to the remaining traditional reserves of oil and natural gas. We could burn those until they’re gone, but declare an immediate moratorium on coal, and that would be OK, according to our defined danger limit of 2°C. A third perspective is that if we could limit emissions to 5 Gton C per year starting now, we could continue doing that for 250/5 = 50 years. One final note: most of the climate change community, steered by Kyoto and IPCC, limit the scope of their consideration to the year 2100. By setting up the problem in this way, the calculation of a safe CO2 emission goes up by about 40%, because it takes about a century for the climate to fully respond to rising CO2. If CO2 emission continues up to the year 2100, then the warming in the year 2100 would only be about 60% of the “committed warming” from the CO2 concentration in 2100. This calculation seems rather callous, almost sneaky, given the inevitability of warming once the CO2 is released. I suspect that many in the community are not aware of this sneaky implication of restricting our attention to a relatively short time horizon. Can you please provide some indication of the degree of ocean acidity increase that these numbers involve? For example, what pH changes would arise from 500Gt C staying in the air. Have any of the stabilisation studies addressed the impact on marine life? ie. stabilised at 450ppm is a common idea (though that ship may have already sailed), what would that mean for ocean acidification? RealClimate does an excellent job on reporting the facts about global warming. This piece on co2 emissions is one of the best, realistic, fact driven summary of the current state of affairs.Realclimate should be required reading for every member of the House and Senate.I believe that worldwide co2 emission levels should be immediately reduced by 80%, right now, for us to have any viable chance at reducing the negative impacts of the global warming trends already in the pipeline.The latest conference. in Nairobi, of the parties to the UNFCCC must extend Kyoto beyond 2012 and implement much greater restricions that those currently in effect.Once again, thanks to RealClimate for all the work that you do. Could a 500Gton “emission slug” reasonably called safe given other likely impact besides atmospheric ones the kinds of consequences of ocean acidification that some studies (e.g. The Royal Society, June 2005) point to? Given the environmental changes we are already seeing with less than 1C warming, the idea of 2C being “safe” may need some clarification. Is 2C the point at which some irreversible “tipping” points are thought to occur (meridional overturning current disruption; clathrate release; ice-sheet loss; forest die-off; …)? Putting it another way, can we expect the climate and environment around us to be familiar and reasonably livable still at 2C, for the long term? [Response:Replying at once to this comment and the last (#3). The word “safe” seems a little weird to me in this context also. A smaller CO2 slug would definitely be better. I think Hansen takes 1 degree C as his “safety limit”. I guess they’re also referred to as “danger limits”. Maybe that’s a bit better word. And in response to just #4, it’s not as clear cut as that to predict when any sort of tipping point might be reached and what it might be that tips. Who knows? We can’t even figure out past tips, let alone predict future ones. It is silly to say that a rise of up to 2C in global temperatures is not dangerous. A global increase of 2C means will mean an increase of at least 4C on the continents, because they heat much more than the oceans which provide 70% of the surface. Moreover, with polar amplification you will get 8C in mid latitude continental areas such as the USA and Europe, and up 20C in polar regions. That will means a rapid thaw of the Greenland ice sheet, which is already starting to melt, and so the flooding of New York, London, and nearly every other port in the world. Here I am emphasising the effects on the developed nations, not out of chauvism but because there is a myth that it is the developing nations who will suffer and we in the west will get off scot free. It is obvious to me that with a 33% increase in CO2 above preindustrial levels, we have already reached the limit of a safe increase. The scientific commitment to higher temperatures from the one third increase will lead not only to sea levels that will flood our cities, but also to an increased number of hurricanes, drought and floods that we are already seeing. OTOH, the record wild fires that the USA has experienced this year can not continue to increase, since eventually the lack of unburnt forests will set a limit! But unless the scientists come down out of their dreaming spires, join the political debate, and tell the politicians it is time to stop, we will continue to sleep walk towards the precipice, and eventually step over the edge. We do not know the cause of rapid climate change, so we are running forward like a man wearing a blindfolded. What could be more insane than that? When are you scientists going to admit that you do not know all the facts? When are you going to have the courage to admit that you are wrong, and that your hubris has led the world to the brink of disaster? The Stern report focused on carbon dioxide equivalent, at least the portion I’ve read, citing current atmospheric levels of GHG of 430 ppm carbon dioxide equivalent and discussing stabilizing at 550 ppm or lower. I’ve heard a few people say that we are really at 420 or 430 ppm CO2 equivalent already, once the increase in other greenhouse gases is taken into account. What is the figure for CO2 equivalent at present or where can I find it? Thanks! Once again it comes down to what the politicians can do in this regard whilst maintaining economic prosperity (seems to be a prerequisite for politicians all over the world apparantly). I still cannot see humankind reducing the CO2 levels by the amount required because we will burn all of the available natural GAS and Oil whilst continuing to burn coal through it all because even if we had an alternatibe to Oil/GAS/Coal it nould take 50 years for a worldwide rollout anyways which will still give us potentially dangerous warming because levels of CO2 burning are going to rise worldwide by 50% by 2040. Its a nasty situation by all accounts. [Response:Gavin is an atmospheric modeler, I’m a water guy, so I defer on 3.7. For what it’s worth here’s how I did it. The problem with emission cuts is that we won’t be able to see the science get validated. That would be a real shame. Does this warming estimate include the effect of the current earth energy imbalance which means that there is considerable heat stored in the sea which will come out over the coming decades regardless of CO2 concentration in the atmosphere? I regard Realclimate.org and the work you guys do very highly. However, I feel that this post oversteps the boundaries of what the blog should be about — communicating and commenting on climate _science_. If we consider improvements in human welfare to be our ultimate goal, judgements on what constitutes a ‘dangerous’ or ‘safe’ level of climate change should be based on careful economic analysis, itself ultimately based on a consistent system of values (or a number of alternative value systems, if we find it difficult to agree on a common one). Mitigation of climate change does carry costs, so the question is not trivial! The analysis should, obviously, be as complete as possible, in the sense of considering uncertainties and insuring sufficiently for them, considering potential extreme outcomes, considering the effects the inequal global income distribution has on the analysis, and so on. However, ultimately, the question of what is a ‘dangerous’ level of climate change is not a scientific question, but an economic and ethical one! I feel Realclimate.org would be stronger for sticking to its chosen mission and recognizing its limitations. Maybe you should encourage a bunch of climate change economists to start a ‘twin’ blog focusing on the economic / ethical issues? Our young climate scientists not only claim to understand global climate, a very debatable claim, but they also claim to be able to forecast the evolution of technology and the human condition 100 years from now. I would like to point out that some of the figures presented in this article are rather different than those given by James Hansen (eg. in this summary). David says fossil fuel emissions are “5 Gton C per year from fossil fuel combustion, with a further 2 Gton C per year from deforestation,” while Hansen states that annual emissions are now 7.5 Gigatons. The 2 Gt/yr for deforestation seems rather high, even if you count forest fires. David says “the natural world is absorbing CO2 at a rate of about 2 Gton C per year into the land biosphere and into the oceans, for a total of about 4 Gton C per year,” whereas Hansen says “The ocean is thought to take up about 20-35%, leaving 5-20% as the net sink in vegetation and soil.” While a little uncertain, it suggests the ocean takes up quite a bit more than the land. David assumes a climate sensitivity of 3.5 degrees C for doubling CO2, while Hansen works with 2.7 degrees C.
Finally, David says “The models tend to predict a maximum atmospheric CO2 inventory of about 50-70% of the total fossil fuel emission slug.” Given that about 60% of CO2 is being absorbed now, with little change in trend over the past few decades, what is going to change to reduce that amount substantially? I think the post actually could have gone much further toward policy without leaving the domain of science – there’s an awful lot of science required to determine the impacts of a given level of CO2/warming on the biosphere etc. before getting to the economics. Too many economic impact assessments start with the assumption that welfare=consumption and the global distribution of agriculture and capital is in equilibrium with climate, and neglect the physical world. The figure of reducing CO2 emmisions down to about 10% of current emmisions answers half of a question I’ve had about AGW. The other half is beyond the scope of this blog, but can anyone point me to a discussion of how much fossil fuel is used for various applications? With current technology any stationary uses of energy can be done with a mix of nuclear, hydroelectric etc., but small mobile machinery like cars, bulldozers & farm tractors are hard to run on anything but fossil fuels. I’ve seen energy use broken down into categories like transportation etc, but we need more detail to determine how low emmisions can go with current tech, since railways can be electrified & large ships can run on nuclear. Also, any practical cuts would have to be a few % a year continued over decades, as old equipment is replaced with non-fossil or more efficient equipment. How does such a gradual decline in emmisions affect the calculated climate effects? The Montreal Protocol was by no means inevitable. Knowledgeable observers had long believed it would be impossible to achieve. The ozone negotiators confronted formidable political, economic, and psychological obstacles. The dangers of ozone depletion could touch every nation and all life on earth over periods far beyond politicians’ normal time horizons. But although the potential consequences were grave, they could neither be measured nor predicted with certitude when the diplomats began their work. In the realm of international relations there will always be resistance to change, and there will always be uncertainties. Faced with global environmental threats, governments may need to act while some major questions remain unresolved. In achieving the Montreal accord, consensus was forged and decisions were made on a balancing of probabilities — and the risks of waiting for more complete evidence were finally deemed to be too great. “Politics,” stated Lord Kennet during ozone debates in the House of Lords, “is the art of taking good decisions on insufficient evidence.”14 The success of the Montreal Protocol stands as a beacon of how science can help decision makers to overcome conflicting political and economic interests and reach solutions. The ozone history demonstrates that even in the real world of ambiguity and imperfect knowledge, the international community, with the assistance of science, is capable of undertaking difficult and far-reaching actions for the common good. 2006 was a record-breaking year. The area of 29 million square kilometers (11.4 million square miles) on September 24 tied the largest value (on September 9, 2000) and the value of 85 Dobson Units on October 8 was the second lowest ever recorded by satellite measurements. The year also saw the second largest sustained ozone hole. In September and October, temperatures in the middle stratosphere set many record lows. The carbon flux numbers are quite dated. It’s now over 8Gt per year from fossil fuels, and rising very fast. See this link for a graph through 2004. (that’s emissions data from ORNL through 2002, extrapolated by BP fuel production data after that). It’s extremely hard to see how we can stabilize the climate change under 2 deg C on this trajectory, and yet 2 deg C itself seems a dangerously high goal (given Eemian sea level 5m or so higher than present and the present lack of quantitative understanding of how fast the ice sheets will equilibriate to give that sea level). There’s also a Science paper this week arguing that maintaining concentration below 450 ppm (which they take to be the threshold for 2 deg C) would require in the near future reaching an annual 3.2% reduction in carbon emissions. …but, if aerosols are a net negative and given that they have an atmospheric residence time of ~days-weeks compared to ~centuries-millenia for CO2, CFCs, then it’s a bit non-useful to cancel out some of the other non-CO2 forcings with aerosols. From a scientific point of view [rather than a political/economic point of view] I’m really worried that the 500-550 ppm CO2-eq stabilisation level takes us far too close to the edge. There are a lot of thresholds at around that ballpark level: Greenland, permafrost melt; soil carbon feedback. It would seem to me that an emissions pathway that took us to 550 ppm, could easily end up being a lot higher [750+?] if we were “unlucky”. From a politics/economics point of view, I still don’t see any sign of concrete policies being proposed that would limit CO2 emissions at all, let alone stabilise them at any level <1000 ppm. You simply have to look at where the investment money is going [or not going] in terms of the oil majors, etc, to see that the captain hasn’t given the order to turn the supertanker around yet. It does seem bizarre that still nothing is really changing on the ground. Sorry if this comment is only incidentally related to this posting, but I am surprised to see that RealClimate has so far let Christopher Monckton’s attack on the Stern report, the IPCC, Mann’s hockeystick, James Hansen, etc. go unaddressed. I wouldn’t have mentioned it, except that it received front page attention at Slashdot and a surprising number of links at del.icio.us, which suggests to me that the denialists are really latching onto this piece. Is there a refutation in the works at RealClimate? It could probably just be a series of links, since most of the arguments made by Monckton have already been refuted here. … 2C seems a reasonable danger limit. This would be decidedly warmer than the Earth has been in millions of years, and warm enough to eventually raise sea level by tens of meters. (b) Why 3.5C rather than 3.0C ? I am not a mathemetician or a scientist. I have a layman’s question. Assume that some wake up call achieves a revolutionary shift in political priorities re GHG emissions. A year of anarchy perhaps in which gas guzzlers and Beoings are destroyed on the tarmac by an uprising of concerned citizens round the world. Assume that this is enough to make world politicians realise that they should start worrying about their granchildren instead of their own careers. Assume that this year of anarchy occurs in 2008 and as an immediate result GHG emissions were held constant at end 2007 levels through 2008. Following this, the world political community realise that radical global change has to occur in order to return order to the streets. After 2008, by some miracle of honest and fair implementation, global regulation perhaps, that global GHG emissions reduce by 5% per year until end of 2024 (straight line attrition) and that in 2025 fossil fuel use flattens out at 20% of the 2008 level of GHG emissions. Assume that sanctions on the burning of fossil fuels allows innovation to deliver substitute renewable energy sources to sustainably replace all attrition in fossil fuel exploitation. Would this scenario be enough to hold the world temperature increase within the “Stern” 2 degree C target in the longer term? Best Case/Worst Case. Could the GHG emission reduction strategy be less severe than this? Anybody prepared to have a go at this calculation? Phil – A concerned Grandad. RE 21, Timothy wonders why nothing is really being seen on the ground. If there is sufficient ice hung up above sea level to give us say 20 metres of sea level rise, then I wonder if the thing that is holding it all together at the moment is the input of the anthropogenic forcings into the latent heat of fusion being absorbed by all that ice. It’s a huge sink. I’ve noticed that if you put a pair of ice cubes in a box, then they both hold up until they are both ice at zero C, then they both melt with a rush when the trigger Joule is absorbed. If the same thing holds at a global scale, then when it starts to happen we will definitely be living in “interesting times”! I guess a measure of that issue would be the proportion of global ice that is currently at zero C. Do we have any idea of that? You mention a climate sensitivity of 3.5 C for a doubling of CO2 and say that it’s a typical value. I was under the impression (or wishful thinking) that 3.5 C was more towards the high end of the range for climate sensitivity. Are there any estimates of the likelihood of different climate sensitivities? What range for climate sensitivity is the IPCC working on? Thank you. He says, “We believe climate models are programmed with excessive climate sensitivity based on a flawed understanding of past ice ages. Moreover, climate models wrongly magnify potential warming to accommodate positive feedback mechanisms while comparison with empirical measure shows negative feedback dominates, reducing warming experienced to about half theoretical values. The challenge is for you to actually check the numbers — see for yourselves whether we are wrong or not. Look up Stefan’s Constant or just use 5.67 x 10-8 (close enough for our purpose but look it up to be sure). Now use it to check the assertion: “Global climate forcing was about 6 1/2 Wm2 less than in the current interglacial period. This forcing maintains a global temperature difference of 5 °C, implying a climate sensitivity of 3/4 ± 1/4 °C per Wm2.” Either consult your texts for Earth’s temperature in Kelvin and any other numbers you need or see the numbers we’ve used here. Off you go — we’ll wait. Back so soon — how did you go, prove us wrong yet? Well, we’re waiting. All you need to do is show us where we’ve messed up the calculations and we’ll publicly retract and correct. We’ve left you plenty of opportunities in our analysis of models and climate sensitivity. While you are about it, see how the “smoking gun for global warming” turned out to be nothing but a clown gun, just another failure of “global warming proof” that didn’t make it into mainstream media coverage. Why is that? If it’s proving too hard following a moderately complex document, try this simple one where we find significant heating does not trigger self-perpetuating enhanced greenhouse from the most prolific and important greenhouse gas — water vapor. Same deal — show us where we’re wrong and we’ll retract and correct. We believe estimations of “dangerous climate interference” are based on seriously flawed models producing patently ridiculous “projections.” We find no evidence the world is conforming to the models and therefore conclude it is the models that are wrong (aren’t we terrible?). We see no evidence carbon constraint will have any measurable effect on global temperatures and conclude desperate measures to transform energy supply have vastly greater potential for harm than for good. We place our calculations online where scrutiny is invited and expected. I have a few simple layman’s questions. Rather then the data that David lays out we consider the data presented on the Oak Ridge Nat. Lab. that the Global Carbon Cycle Balance on an average year between 1997 and 2002 or even the NOAA data for 2004 we get very different numbers from what I think I read in this article. In the later two examples we have values of between 205 and 210 CT C that goes into the atmosphere and between 207 to 212 that comes out of the atmosphere. Also from these sites we get an average direct anthropogenic contribution to the atmosphere of between 5 and 6.5 GT C where some tables indicate a value as greate as 7.5 GT C (It must be the difference in contribution from deforestation or forest fires). Given this the total anthropogenic contribution to the atmosphere on an annual basis is approximately 3%, if I read things correctly. Though David is likely correct that a reduction of 3-4 GT C would likely allow things to return to a balanced level, it means we must halve the current contribution across the globe to get close to the correct balance. It really does not matter if you recharge your vehicle at the wall socket (Though under nuclear sources this is not true.) or run a methane/ethane/biodiesel converted fossil fuel engine or feed and water your burro your “engine” will still emit high amounts of CO2 with any of these systems. The time necessary to move to a Carbon free energy system is likely a min. of 30 years away. It simply makes much more sense to boost the natural processes 1.5% to sequester the 3 GT C that it currently is not. Would it not make more sense to start the process of dealing with the immediate problem while working on the other issues. It almost appears that the issues will not get dealt with in a timely manner, so why do we we have to endure the “knawing of the bone” Ad Nauseum. Apparently, if it truly was a big deal you would think a few scientists could put together a fully funded NSF research project that involved a research ship to be chartered to dump several tons of Ironite mixed with sargasso weed for 6 months for less then a million dollars per year. If each of the major industialized countries did the same you would be at a balance in next to no time, wouldn’t you? Again, an excellent post. We certainly do need to think beyond 100 years, since we are the ones causing the problem for hundreds of years to come, perhaps millennia. As for economic tipping points, I keep thinking about how the stock market nearly crashed in the 80s bec of a computer glitch (nothing to do with productivity). So, I’d say the economic tipping point (the point at which economic problems, increasing economic inequalities, econ & polit fears, frustrations, fighting, wars, social chaos throw us into a really bad state) is probably well before the 2 degrees warming. Look at Katrina, and scientists tell us that wasn’t caused by AGW (or they are unable to tell us), so what’ll be like in 5-10 years when AGW harms greater than Katrina really start kicking in. Also, another problem w/ neoclassical econ is that it mainly measures the monetization of the economy, not actual productivity, and certainly not quality of life. (For instance they might find a severe hurricane year to be just great, due to all the rebuilding.) And they reduce everything to (or equate everything with) money. While diamonds may be more valuable than bread, we just can’t eat them. Cost/benefit analyses are pretty useless when you’re standed on a desert island. At least paper money can be used as toilet paper, though. I would suggest another measure, “LIFE-YEARS,” over money. So how many life-years is my driving to the coast going to cost re earlier death for people due to GW harms. What we need is a holistic view, including the hard sciences and the social (economic, political, etc), cultural (beliefs, values, ideologies), and psychological (craziness factor) dimensions of the human/world system to fully understand climate change, its causes & consequences. In anthro and sociol they have revitalization (or social) movement theory: people fairly suddenly change and construct a better culture/society. I think that’s our only hope. The problem is large numbers of people have to sense something is really wrong, have some acurate assessment of it, come up with technical and structural solutions, and implement things. I know we have the technical solutions (see rmi.org), we just need to have a social movement to implement them. And it seems no matter how alarmist environmentalists become, people aren’t connecting the problems to their lives or those of their children, and they certainly aren’t connecting the causes to their actions. Forgot to add, “life-years” (measured in earlier death of people) for as long as the GHGs one emits today are doing harm & causing death, part of which could be in the atmosphere for millennia (as David pointed out in a previous article here re life time of CO2 in the atmosphere). And we need to consider all the indirect effects (not just heat deaths), such as crop & potable water loss & destruction of the web of life from AGW, AND wars & fighting due to harms due to AGW. The suicides of drought-stricken farmers in India, etc. In response to comment 19, I think it’s important to recognise that the Montreal Protocol on substances depleting the ozone layer largely became possible when a substitute was found for CFCs in most applications. Essentially, pressure from consummers and the threat of a ban forced CFC companies to invest in R&D of a substitute. When one was found, all of a sudden the lobby groups for these industries started recognising the scientific evidence that CFCs were depleting the ozone and the Montreal conference was held in a matter of months. Finding a substitute dramatically reduced the losses that the CFC industries would suffer from a ban on CFCs (and thus, the political costs), not to mention that it also meant that the practical uses of CFCs would not have to be given up. Unfortunately, the ozone and climate change cases are so different that there really is no basis for hope for climate change based on the success of the Montreal Protocol. In the ozone case, the ban is of one group of chemicals used in fairly limited applications and by just a few major companies. The boycot of aerosols didn’t require big sacrifices on the part of consummers. The same couldn’t be said of a boycot of cars or heating! Also, everybody and all sectors of the economy emit GHGs, not just a handful of companies as in the ozone case. I think it’s very important that further research into the science and economics of climate change help reduce the uncertainty on these issues, but I don’t think that uncertainty is the main obstacle to decisive action. Many policy decisions involving huge investments of public money are made on the basis of far less information than what we have on climate change. If policy makers were told that there was a 30% chance that there would be a terrorist attack on a major city, do you think they would delay action until they knew how many people were likely to be killed? or until studies showed whether the economic disruptions of the attack would be worth the investments in increased precautionary security measures? Changes in the status quo happen when it becomes possible to minimize the losses of the projected losers from a change in policy (or when there are bombs falling on your head). So, the best contribution scientists can do is not to join the political debate, as suggested in comment 5, but to work on technological solutions that will provide 1) low-carbon alternatives to consummers (so they can afford to put commercial pressure on companies to go low-carbon) and 2) technologies such as carbon-capture storage that will minimise the losses of the major GHG emitters who are also major economic actors and as such have significant political influence. “There was an old lady who swallowed a fly ….” Know that cautionary song? You’re putting too much water, too fast, into the bathtub and it’s going to overflow, because the drain’s not designed to remove that much water that fast. What’s your best response? Figure out how to turn down the taps? Or try to enlarge the drain? You can look this stuff up, to find out if anyone has ever thought of it before. Google is your friend. “… some researchers and entrepreneurs have proposed boosting phytoplankton growth by “fertilizing” oceans with iron, a nutrient essential to the organism’s growth. Preliminary tests in the equatorial Pacific Ocean and Southern Ocean since 1995 have shown that seeding seawater with iron does increase phytoplankton populationsâ��in the short run. This may happen anyway, if we see a whole lot of desert dust blown into the oceans from China and the Sahara — whether we want it to happen or not. I wonder if everybody understands that the concentration of greenhouse gases in the atmosphere determines the excess of solar input compared to the longwave IR radiation to space. This determiones the RATE of temperature rise. If the GHG concentration does not change, the temperature will keep rising. Perhaps it was just a throwaway comment that I’m reading too much into, but I have to ask whether this assertion is simply axiomatic, or based on some scientific and/or moral judgement. Perhaps David’s thinking of precautionary folk wisdom, as in “don’t make waves, don’t rock the boat”? No. You missed my point. The problem of horse pollution was solved by technological advances, not by limiting the growth of cities, limiting economic growth, or putting arteficial caps on horse manure production. Nobody foresaw that the problem of horse pollution would be solved by the automobile. In like manner, the pessimists of an earlier day saw the end of civilization because the supply of whales was running out and where would the oils come from which were used to light the cities of the day. Whale oil was crucial as a source of kerosene. That black stuff oozing out of the ground in Pennsylvannia provided the answer. Then, when it looked like the oil industry was doomed by the invention of the light bulb (who needed all that kerosene now) the automobile came along. My point is that technological innovation is still going on. Projecting our current technology 100 years into the future is just not realistic. Certainly an interesting point – and unless you put an absolute premium on non-interference in nature, there is no specific moral reason. After all – to play the cynic – Nature ‘had’ the planet for 4.55 billion years before humans and will presumably ‘have’ the planet for several billion years after humans [go extinct]/[migrate into space]/[undergo technological transendance]/[insert future here]. But from a purely practical/economic point of view.. our agriculture is build around a constant climate and any change will be bad because a farmer needs to know the likely weather to know what to plant. Our cities need fresh water; if climate changes and rivers stop flowing then many cities will be written off; and the effect of sea level rises on the large percentage of the world’s population that lives on the coast goes without saying. So.. it’s not an axiom, but there are two angles – if we completely screw up the environment then it’s going to take longer than human timescales to recover even if we clean up our act later, and it’s almost certainly going to hurt us economically by more than the avoidance cost. Re #33 It is obvious from Gavins’s reply that he is not aware that the level of carbon dioxide determines the rate of increase in temperature. However, the temperature does not keep rising, because higher tempertures mean more water vapour and clouds which reflect more of the incoming solar energy away, and a balance is reached. Re #34 I can’t speak for David, but there is a logical reason why we should not change the climate. Modern society has tuned itself to exist on the planet as it is. Agriculture is arranged to match the local climate, and buildings are designed for the climate in which they were built. For instance, in Europe the slope of roofs is set to match the winter snowfall. In a warming world, here in Britain the central heating boilers will need to be replaced with air conditioning units, and the wall to wall carpets with tiled floors. Any change in climate will involve vast costs of adaption. More serious is the desertification of the Mid West of the USA, already under way, and the subsequent reduction in global grain supplies. But a warming world will also mean that the Greenland ice sheet melts. A 20 foot rise in sea level, which now seems inevitable, will have few advantages. Travelling through the streets of London and New York by gondola, are the only one I can think of! Re #22 Here is a rebuttal of Christopher Monkton’s piece that I wrote earlier. Here are replies to his ten propositions. You can see that I accept none of his conclusions. He is just a charlatan holding out false promises. Wrong! All credible scientists do agree that global warming is mainly caused by greenhouse gases. However, the debate is not over anymore than the debate over evolution is over. Creationists and their fellow travellers will ensure that! Wrong! From all the available evidence points to the current global temperature being higher than at any time during the last 1000 years. However, that is unimportant since it is the temperature rise in the future that will do the damage. At present we are surviving fail well, except in New Orleans. Wrong! The main source of warmth on the Earth is solar flux. However, there has been little change over the last 100 years, and especially the last ten when temperatures have been at record levels. Wrong! Extreme measures have been taken in order to correct any errors that may have occurred in temperature readings in order to ensure their accuracy. Examples are the corrections for the urban heat island effect, and for the adiabatic temperature difference in water temperature caused by the height of deck of the ship when taking sea surface temperatures. Wrong! The 1000 page IPCC report is enough evidence for me that greenhouse gas increase is the main cause of global warming. What proof would all Mr Monckton accept? Wrong! Humans have tuned their agriculture and housing to the climate as it is now. Any alteration in climate will have severe costs, and the benefits such as gondolas in the streets of London will be trivial. Wrong! The Paleocene-Eocene extinction and the Permian-Triassic mass extinction are both thought to have been caused by release of methane hydrates. This could happen in the future if ocean temperatures rise too much. Only last night on BBC’s Planet Earth it showed that the polar bears are threatened, and will be doomed if we do nothing to stop the Arctic ice melting. Wrong! The Kyoto limits would not make much of a difference but the were only intended as a pilot experiment. The full limits cutting CO2 emissions to 40% of today’s levels would have an effect. Wrong! If you do not ignore or downplay the costs of global warming, which should include a rise in sea level of 7 meters, drowning London and all other British ports, then the costs of doing nothing soon escalate. Wrong! Who does not take out house insurance against fire, flood etc. against the full value of their home? If you were to consider the odds of it burning down then it is only one in a hundred, so why not only insure for 1% of its value. That is the false reasoning of the self proclaimed Monckton of Brenchley! 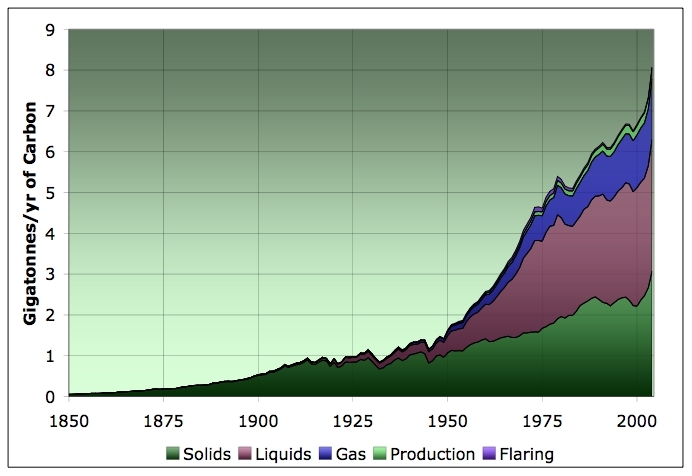 Is it possible to get the good amounts of fossil fuel CO2 and deforestation or land-use CO2? When I look at NASA-GISS, I don’t find David’s amounts. As to your tub issues, it depends, which can you do most economically, turn down the taps or make the drain larger? If it takes thirty years to turn down the taps 3%, costing 4 trillion dollars and only takes one year to cut out a 3% larger drain costing 3 million dollars, which do you think is the likely action? In the meantime, government can address the increase towards the possible 15% anthropogenic contribution in 30 years. (Note: You are unlikely to make the drain 15% larger.) The result is you can economically deal with your current issues and set in motion a economically responsible movement towards a solution with a deadline in the future. (Of course if ecologists keep pushing as hard as they are now without taking action themselves the general attitude of the population at large is likely to rebound in the opposite direction, (as was the apparent case in 1980, when economics ruled and the environment returned to the pre-1976 condition for 20 years.). There is no such thing as a ‘trigger joule.’ It takes an enormous amount of energy to melt ice from a 0C solid to a 0C liquid (roughly enough energy to heat that liquid to 80C). Try it – take an ice cube that’s at 0C and put it in a small glass of lukewarm water. See if the water is still warm after the ice is melted (it should be just as warm if ice melts as you so describe). 1 – Take a piston and fill it with water at 0C. 2 – Have the water spontaneously freeze by removing 1 joule of heat to push it over the edge (pushing against the piston will further cool the ice, pushing it somewhat below 0C) (the joule can be removed just by tugging on the piston a bit – decompressing a solid does cool it down by some tiny amount). 3 – Melt the ice using heat from the outside. 4 – Go to step 2. See the Marland and Houghton datasets at CDIAC. Another view on CO2 emissions can be found on http://www.1ocean-1climate.com/climate_changes_today.php. You can find there a nice graph about the emissions of CO2 in 1990, ordered by states. Also, there are some elements highlighted regarding the impact that the ocean and naval war has on climate change. Looking at the CO2 graph mentioned above, it looks as if we produced around 5Gt in 1980, 8Gt in 2000. Very round figures. The Mauna Loa graphs suggest that if I cut my CO2 production next year to 1980 levels, the increase in atmospheric CO2 will still be around 1.5/1.7ppm, the same as this year, the same as 1980. David Cooke — I can’t come up with sensible responses to your postings, sorry. They don’t make sense to me, from what I know of the science. It seems to me you’re making up fanciful speculation about what might be the case with both CO2 absorbtion and primary production/ecology and saying “why can’t this be true.” Look to nature for your basic facts before you speculate about how nature ought to or might most conveniently work.